Enka® TecTape Hybrid Roving is the starting material for the fully automated manufacture of continuous fiber-reinforced composites with a thermoplastic matrix. Thanks to its twist-free and tape-like structure, Enka® TecTape Hybrid Roving efficiently combines continuous reinforcing fibers with thermoplastic matrix fibers. The resulting small distance between matrix fibers and reinforcing fibers enables short flow paths and consequently short cycle times in the manufacture of fiber composite parts. 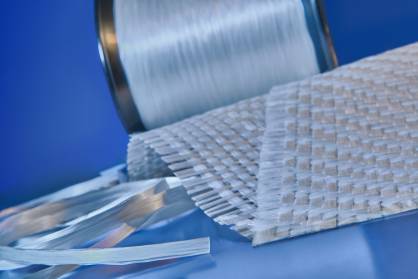 Enka® TecTape Hybrid Roving is flexible and its lowfriction and fluff-free roving surface allows exceptional load-specific and convenient processing into complex fiber composite parts on a textile basis. Diolen® 150BT is the first technical polyester yarn with PLA polymers which are also biodegradable in composting facilities. Thanks to its greater strength compared to textile yarns, it is particularly suitable for use in agricultural textiles requiring limited durability. Enka® Nylon BIO is a bio-based technical polyamide yarn which should be considered as an equivalent alternative to petroleum-based yarns, such as Polyamide 6 or 6.6. It has comparably good yarn and polymer properties and additionally features lower moisture absorption and polymer density. PHP Fibers will be represented at Techtextil 2017 for the first time together with sister companies from the parent company Indorama Ventures.